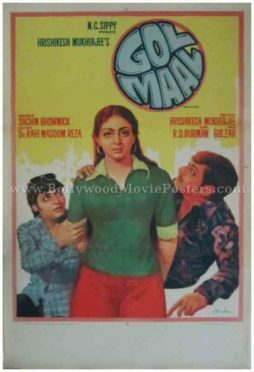 Very rare Hindi comedy movie poster of the blockbuster Bollywood film, Gol Maal (1979) for sale. This is an actual surviving original first release Bollywood movie poster of the 1979 Hindi comedy that is unanimously considered to be the greatest comedy film ever made in Indian cinema. Printed and circulated somewhere in the late 1970s during the original first release run of the film, this rare Hindi comedy poster was designed and printed for publicity of the film but never ended up being used. This Gol Maal movie poster was originally designed in hand painted oil on canvas format. The lead actors of the film, i.e. Amol Palekar, Bindiya Goswami, Utpal Dutt and Deven Verma are seen in superbly hand painted avatars in this original Gol Maal movie poster. The background is simplistic and the focus is on the star cast. 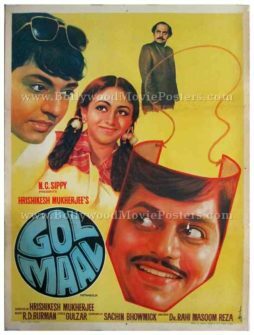 Amol Palekar is seen in two different avatars (with and sans a mustache) in this original Gol Maal movie poster, giving away the double role plot of the film. Gol Maal (Forgery or Deception) is a 1979 blockbuster comedy film directed by Hrishikesh Mukherjee, starring actor Amol Palekar in a double role. The film won high accolades from critics and went on to become a cult film in the history of Indian cinema. Considered to be the greatest comedy film ever made in Bollywood, Gol Maal’s dialogues and characters have spawned hundreds of spoofs, which are popular till today on television shows and radio stations. Owing to its mega popularity, the film was later remade in several languages such as Tamil, Kannada and Malayalam. The 2012 Hindi film Bol Bachchan is also believed to be inspired from Gol Maal. 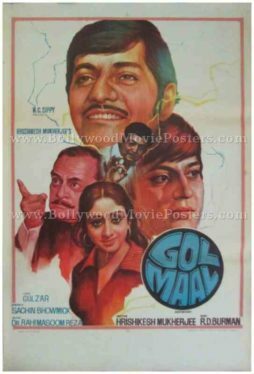 Very rare Indian comedy movie poster of the blockbuster Bollywood film, Gol Maal (1979) for sale. This is an actual surviving original first release movie poster of the 1979 Hindi comedy that is unanimously considered to be the greatest comedy film ever made in Indian cinema. Printed and circulated somewhere in the late 1970s during the original first release run of the film, this rare Indian comedy poster was designed and printed for publicity of the film but never ended up being used. This Indian comedy poster was originally designed in hand painted oil on canvas format by Bollywood’s greatest movie poster designer, Diwakar Karkare. His printed signature is seen on the bottom right hand corner of this Gol Maal movie poster. Typical of Diwakar’s art style and fantastic realism, this Gol Maal movie poster features Amol Palekar in two different avatars flanking either side of actress Bindiya Goswami who is seen in a superbly hand painted portrait at the center. The poster gives away the double role plot of the film, with Amol Palekar’s portrait appearing both with and sans a mustache. 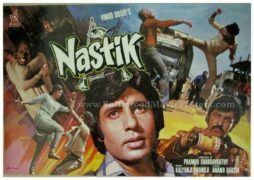 Old Bollywood movie showcard of the Hindi film, Nastik (1983) for sale. This is an actual surviving vintage Bollywood showcard of the 1983 film that starred the greatest superstar of Indian cinema, Amitabh Bachchan. Printed and circulated during the first release of the film (somewhere in the early 1980s), this old Bollywood showcard was designed and printed for publicity of the film inside a cinema hall. Showcards were used as pin ups on notice boards inside foyers of cinema halls. Printed on photo paper, they were often mounted on cardboard to make them easy to display. 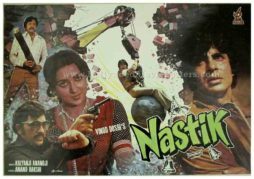 This rare surviving showcard was actually issued to a cinema hall that screened the film Nastik, making it highly collectible! This old Bollywood showcard features an interesting collage of photographic stills and was originally designed by the greatest and most expensive Bollywood poster artist of all time, Diwakar Karkare, owner of Studio Diwakar. His printed signature is seen on the bottom left of this old Bollywood showcard. This old Amitabh showcard features still photos of several action packed scenes from the film. This is an actual surviving vintage Bollywood showcard of the 1983 film that starred the greatest superstar of Indian cinema, Amitabh Bachchan in the lead role. This old hand painted Bollywood showcard features a stunning close up portrait of Amitabh Bachchan. Interestingly, his face has been painted in green. A smaller full length portrait of Amitabh appears alongside along with highly realistic portraits of Hema Malini and Pran. This old Bollywood showcard features an interesting collage of photographic stills and was originally designed by the greatest and most expensive Bollywood poster artist of all time, Diwakar Karkare, owner of Studio Diwakar. His printed signature is seen on the bottom left of this old Bollywood showcard. This old Amitabh showcard features still photos of several key scenes from the film. Very rare original old Bollywood movie poster of the blockbuster Hindi comedy, Gol Maal (1979) for sale. This is an actual surviving original first release movie poster of the 1979 Bollywood film that is unanimously considered to be the greatest comedy film ever made in Indian cinema. 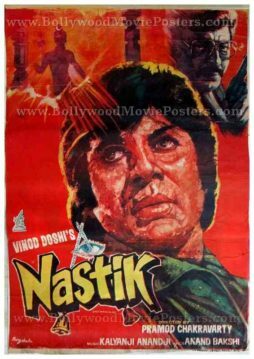 Printed and circulated somewhere in the late 1970s during the original first release run of the film, this rare Bollywood poster was designed and printed for publicity of the film but never ended up being used. This poster was originally designed on a hand painted canvas by Bollywood’s greatest movie poster designer, Diwakar Karkare. It bears Diwakar’s printed signature on the bottom right hand corner. Typical of Diwakar’s art style and fantastic realism, the poster features Amol Palekar in his original avatar (sans mustache) in a portrait on the top. Actress Bindiya Goswami is seen in a superbly hand painted avatar alongside. Interestingly, to signify the double role plot of the film, Amol Palekar’s face appears painted on a mask (with a mustache) at the bottom. A photographic still of Utpal Dutt is seen on the top of this Diwakar masterpiece. This poster has been graded as ★ AI (As Is) due to a small missing piece as seen clearly in the photograph. Please study the accompanying image carefully before making a purchase. Spectacular hand painted vintage Bollywood movie poster of the Hindi film Bemisal (1982) for sale. 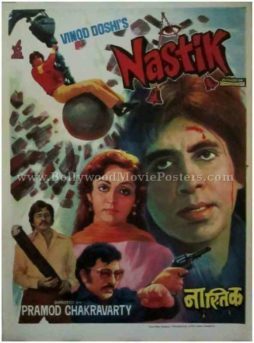 This is an actual surviving poster of the 1982 film that featured the biggest superstar of Indian cinema, Amitabh Bachchan in a double role. Bemisal won critical acclaim and Amitabh Bachchan’s performance in the film is considered one of his finest till date. Printed and circulated during the first release of the film, this vintage movie poster was originally designed for publicity of the film but never ended up being used. This old Amitabh poster was originally designed on a hand painted canvas, making it very collectable. It features a spectacularly accurate side profile of Amitabh Bachchan, hand painted in a variety of shades to capture the density of his character. 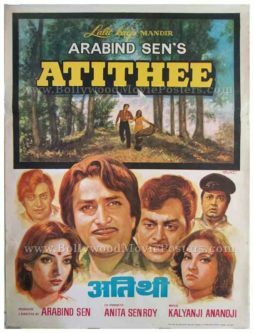 Actress Raakhee is seen in yet another fantastic rendition on the side of the poster, whereas the two supporting actors Vinod Mehra & Deven Verma appear on the top. 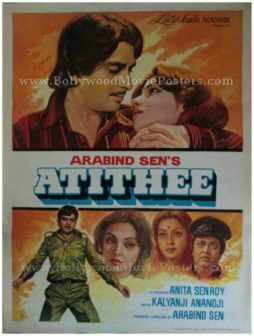 The typography used in this old Amitabh poster is completely in Devanagari Hindi, except for a translation of the title into English. 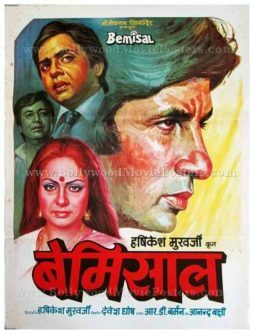 Bemisal (Unprecedented) is a 1982 Hindi film directed by Hrishikesh Mukherjee starring the greatest superstar of Indian cinema, Amitabh Bachchan, in a double role. Amitabh Bachchan won critical acclaim for his flawless performance as both doctor and (mentally insane) patient in his double role. The film is regarded as one of his best acting performances till date.